Skin Rejuvenation to treat saggy skin, loss of elasticity, cellulite, or textural irregularities. It is recommended to complete 3-5 treatments to achieve maximum results. Save 15% when you buy a package of 3! 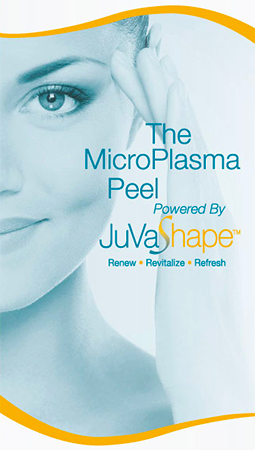 VSHAPE MICROPLASMA PEEL used to treat fine lines and wrinkles, scars, blemishes, and irregularities in skin texture and tone. It is recommended to complete 3-5 treatments to achieve maximum results. The Gold Standard for Laser Hair Reduction in all Fitzpatrick skin types. It is a dual wavelength laser platform that combines the fastest and most powerful 755 nm Alexandrite laser with an equally powerful 1064 nm Nd:YAG laser for high performance treatment capabilities in terms of speed, efficacy, ease-of-use, performance, safety and patient satisfaction. All pricing and packaging ranges based on area of desired Laser Hair Reduction. GentleLase Vein TreatmentCosmetic Laser Vein Correction – Laser energy is absorbed by the pigment in your blood and collapses the unwanted vein. The laser energy is delivered superficially through a hand-held device with a cooling tip that protects your skin. SCULPSURE is a non-invasive body contouring system for the reduction of stubborn fat in areas such as the abdomen and love handles. The 25 minute procedure destroys 24% of treated fat cells without surgery. Sculpsure is ideal for people with trouble spots, particularly those that seem resistant to diet and exercise. Start seeing results as early as 6 weeks with optimal results seen at 12 weeks. Formostar Far Infrared Body Wrap System is a relaxing 50 minute treatment for weight loss and pain management, including arthritis. It’s great for helping to diminish the appearance of cellulite and there is never a need to disrobe… it wraps right over your clothing!